Twelve-story affordable housing on West 117th Street in Harlem. A nine-story condo building will face West 116th Street. Image: Courtesy of GreenbergFarrow. Two-building project will include market-rate condominiums on West 116th Street and an affordable rental building on West 117th Street. On August 17, 2011, the City Council approved L+M Development Partners Inc.’s proposal to develop two mixed-use buildings on a through block lot between West 117th and West 116th Streets, in the block between Fifth Avenue and Malcolm X Boulevard in Harlem. The midblock project will be developed on a lot currently used by an adjacent building as a parking lot and a basketball court. L+M requested a rezoning to facilitate the construction of a twelve-story condominium building fronting West 116th Street and a nine-story affordable housing building fronting West 117th Street. The eastern portion of the block, including the project site, was formerly zoned R7-2. The proposal extended an existing C4-5X district mapped on the block’s western portion to include the entire block. 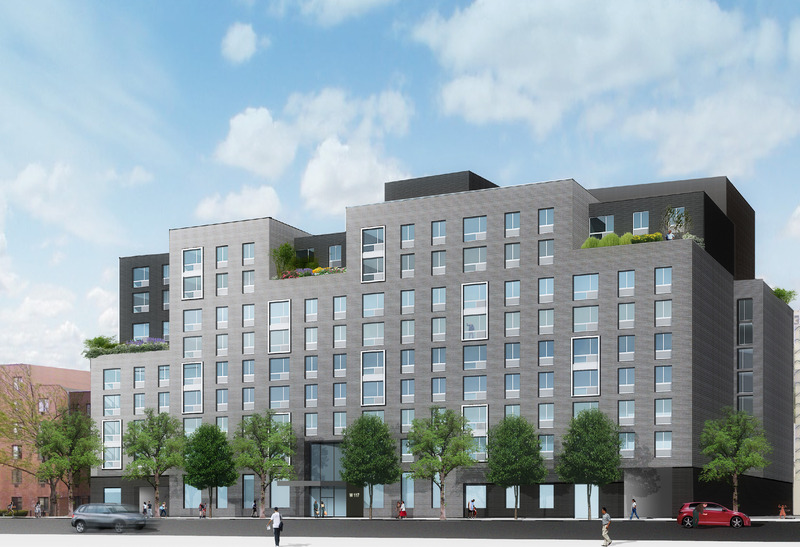 The West 116th Street building will provide 95 market-rate condominium units, and the West 117th Street building will include 100 affordable units for households at or below 60 percent of the area median income. The two buildings will be joined by a private terrace for condominium residents. At the City Planning Commission’s public hearing, L+M’s Tell Metzger stated that the placement of the two buildings had changed during the project’s public review based on input from the community. Addressing concerns raised during Manhattan Borough President Scott M. Stringer’s review, Metzger said L+M agreed to pursue restrictive measures that would prohibit certain office and hotel uses in the building along West 117th Street. A representative of the Kalahari Condominium at 40 West 116th Street criticized L+M’s outreach efforts, but supported the decision to site the condominium building on West 116th Street. 8 CityLand 106 (Aug. 15, 2011). The Commission unanimously approved the proposal. West 117th Street. The Subcommittee unanimously approved the proposal, as did the Land Use Committee and the full Council.